My oh my, did I get inspired this month by Counterfeit Kit Challenge. The inspiration kit is from Noel Mignon, called Soda Shoppe. This is a huge kit. Over twenty sheets of paper and cardstock. A bit of technique products and lots and lots of embellies. Just the way I like it. Problem is, I can't see the trees for the forest, so I took a hint from Lisa H. and made a pintrest board based on the list of papers. I don't know how to do a screen shot but the link should take you to it, if you are interested in the details of the kit papers. 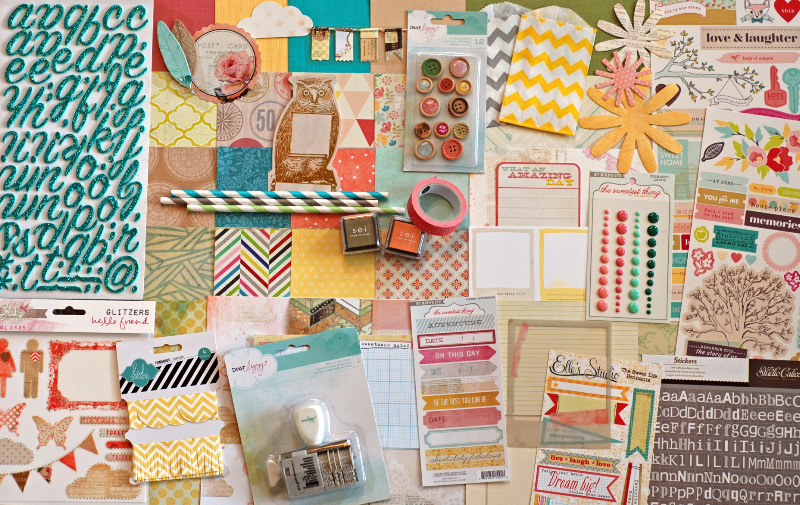 So after several hours of hunting down and pinning photos, and day dreaming about papers when I had to go do other non-scrappy stuff which unfortunately is expected of me sometimes, I got down to the seriously fun job of shopping my stash to create my kit. "Go Town!" is the favorite expression of two year old granddaughter, Rebecca. "Town" to her is play group, visiting her great-oma, Mommy-and-Me exercise class, library hour and swimming. No wonder she gets up each morning and starts insisting to her mommy that they "Go Town!" The anticipation and excitement for her is probably much like the feelings I get in building my kit and then getting to scrap with it. When a phone call from her this morning started with "Go Town!" I knew I had the name for my new kit. First I decided to incorporate what I could from the remnants of previous kits. I went though my scrap box and pulled in any part sheets and strips and remnants that tied in with the colours of the kit. So there will be bits from Summer Breeze, Twig and Petal, and Frosty Days Cozy Nights and other stray off-cuts that happened to be in the scrap box. The next step was to flip through my drawers of patterned paper. They are divided mostly by colour. After I had worked my way through almost every drawer, (black and purple are not represented in the kit, so they were left alone) I had over 50 sheets for the first round. Curiously, very few of them resembled the patterns in the inspiration kit so my normal literal translation of the kit was not going to work this time. Could it be that working with CKC is depleting my paper stash? One would hardly think so by merely looking at the volume of my collection. Perhaps it means that my stash is getting too dated to match up to the more current kits. Either way, I truly enjoy the process of choosing the papers knowing they will be incorporated into beautiful layouts as the month progresses. The final cut resulted in a selection of 17 papers. Clouds sheet is MUK out of a stack I dismantled a long time ago. Nikki Sivils, Something for Everyone, "For Hilde"
and the last one is MUK with no memory of how or when it joined the party. There are four, very heavy, solid coloured sheets in this collection to start me off but more cardstock will be called in as needed. After the back bone of patterned paper for the kit is determined, then next step is embellishments. Again, I pulled in left-over items from previous kits and stray orphans that spoke to me in the colour sequence and reflected the energy of the papers. The goal will be to deplete this assortment as much as possible. Flowers from Bazzil, Basic Grey, and Prima. journal cards and die cuts from a kit package with owls but memory fails me as to "WHO" it was from. couple of stickers with saying that go right back to my first foray into this craft. H.A. Kidd & Co., Lady Fashion button card, originally 69 cents. In an effort to incorporate a messy technique I have included die cuts left from January kit, to be inked and\or painted into delightful items. and a date stamper from office supplies. And then to round it out some journal cards I made last weekend and a piece of Prima Marketing packaging. Oh that is big, delicious and lovely isn't it? But wait! Why stop at enough, when you can have more than enough!! Out of the original 50 pages pulled, some were so lovely but too multi coloured or too large a scale for a good match up. Won't they make a nice addition though? Add-on Part A is called "On a Lark"
My Minds Eye, Bohemia, Boulevard, "My Little Prince"
And an add-on for paper needs to be followed with an add-on for embellies. (we must strive to maintain a balanced approach at all times) Having taken advantage of a number of sales since last November, I wanted to bring in some of my newly acquired items before they become "old stash" Add-on Part B is called "All the Way!" CTMH, Keyboard Kraft Alphabet. I will also be using random sets of partially used Thickers in an attempt to use them up. Or at least, to use them. Mabel die-cut titles, "Little Lady" "Love" "Play" "Joy"
Hattie "die-cut titles, "Boy" "Remember" "Buddies"
So there we have it. My March 2012 CKC kit, "Go Town!" with add-ons "On a Lark" and "All the Way!" is ready to roll. Whew, I think I need a nap. WOWZA! No wonder you need a nap! You totally went to town on this kit ;) Amazing. Love how you shared your thought process behind the kit and how your excitement is like your granddaughter's! hahahahahahaha, way 2 go.you did good. This is super gorgeous with some extra gorgeous on the side! I am addicted to blues and greens and I love how you pulled them into your kit! And I was also very impressed with those journal cards you made! Great job, girl! hey, you made a board like I did! fun wasnt it and it really helped me identify patterns and colours and it looks like it did the same for you! Go you Sherrie! Love this kit. You have lots of gorgeous papers, many of which I recognise and love so I just know that with your über-productive output, this will really work for you so well! you are really a CKC pro these days! I love crazy large kits and yours is amazing!!! I also love that I see so many scraps and leftovers in your kit!! Isn't it fabulous to use up your supplies!! You have a splendid array of goodness going on here! Especially love that you were shopping the scrap bin & leftovers - way to move those things along. But you couldn't resist plugging in some new goodies, too! I just love that you "saved" all the stray orphans (that made me LOL) and added them to your kit. Your final product is beefy and luscious! 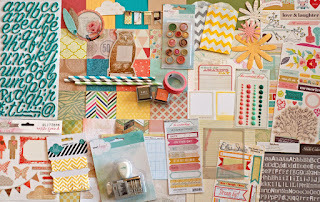 I'm so behind this month in commenting...so I hope you have some layouts in the gallery for me to see!